Postcardiac injury syndrome (PCIS) is a rare condition that is considered to have a trauma-induced autoimmune mechanism triggered by damage to pericardial and/or pleural tissues. We report a case of PCIS accompanied by systemic oedema after thymectomy. A 73-year-old woman was referred to our hospital for dyspnoea and oedema, 9 months after thymectomy. Evaluation revealed the presence of pericardial effusion, pleural effusion and systemic oedema. Differential diagnosis included constrictive pericarditis (secondary to tuberculosis), serositis caused by collagen disease and malignancy. Detailed investigations led to the diagnosis of PCIS, which was successfully treated with prednisolone. This report focuses on the diagnostic approach to PCIS. Since it took time to make a final diagnosis in our patient, we analysed several past case reports and series to determine the cause of the delay in diagnosis. Postcardiac injury syndrome (PCIS) includes a group of conditions referred to as postpericardiotomy syndrome, postmyocardial infarction syndrome and post-traumatic pericarditis.1 Pericarditis resulting from injury to the pericardium, myocardial infarction or thoracic trauma is a feature of PCIS. The incidence of postpericardiotomy syndrome is estimated to be 8.9%.2 The mean latency period between surgery and hospital admission for postpericardiotomy syndrome is reportedly 21 days (range 3–140 days),2 and the median time to diagnosis is 21 days (11–52 days).1 There are no standardised criteria for the diagnosis of PCIS. Abnormalities seen in laboratory testing (leucocytosis, elevated erythrocyte sedimentation rate, elevated C-reactive protein (CRP), chest radiographs (increased heart size, pleural effusion) and echocardiograms (pericardial effusion) provide supportive evidence, but none is specific enough to make a definitive diagnosis. In our case as well, making a final diagnosis of PCIS took some time. To analyse the reason for the delay in diagnosis of our case, we did a PubMed search of previous case reports and case series and evaluated the latent period, symptoms, laboratory data and pathological findings of PCIS. A 73-year-old woman with a medical history of hypertension and glaucoma presented to the cardiology department of our hospital, complaining of dyspnoea on exertion for 1 month and systemic oedema for 2 months. She was not on medication for the hypertension or glaucoma. She had undergone thymectomy for thymoma, 11 months prior to visiting our hospital. 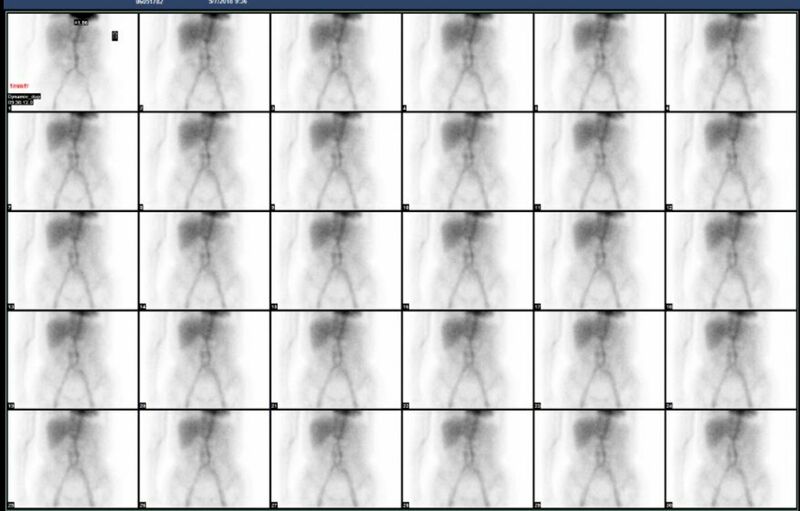 On admission to the cardiology department, chest X-ray showed cardiomegaly and bilateral pleural effusion (figure 1A), although a previous chest X-ray performed 2 months after thymectomy showed no cardiomegaly or pleural effusion (figure 1B). Echocardiography showed pericardial effusion and normal cardiac function. Electrocardiography showed sinus rhythm, complete right bundle brunch block and low voltage in limb leads. Chest CT imaging showed bilateral pleural effusion, pericardial effusion and no recurrence of thymoma (figure 2). Pericardiocentesis and thoracocentesis were performed, both of which were not diagnostic. Therefore, the cardiologist referred the patient to the department of general internal medicine, 1 month after her initial consultation. A general examination showed that she had no arthralgia, skin rash, photosensitivity, night sweats or loss of appetite. However, she had gained 5 kg in weight during the previous 4 months. She did not have any specific family history and had never been abroad. An evaluation of the vital signs indicated a blood pressure of 96/64 mmHg, pulse rate of 75 beats/min, body temperature of 36.4°C and respiratory rate of 22/min. Her oxygen saturation was 95% on 2 L/min oxygen support. She had an evidence of oedema of her face, trunk and lower extremities, the oedema on her trunk and lower extremities being pitting in nature. Jugular vein distension was not seen. Her breath sounds were diminished over the lower lung lobes bilaterally. Cardiac auscultation did not reveal any abnormal cardiac sounds during ventricular systole or diastole. (A) Chest X-ray performed 9 months after thymectomy showed cardiomegaly and pleural effusion bilaterally. (B) Chest X-ray performed 2 months after thymectomy showed no cardiomegaly and pleural effusion. Chest CT imaging after admission showed bilateral pleural effusion, pericardial effusion and no recurrence of thymoma. Laboratory findings showed the following: white blood cell count: 6.6×109/L, haemoglobin: 142g/L, platelet count: 339×109/L, aspartate aminotransferase: 20 IU/L (normal: 13–31 IU/L), alanine aminotransferase: 11 IU/L (normal: 8–34 IU/L), lactate dehydrogenase (LDH): 178 IU/L (normal: 115–217 IU/L), serum protein: 5.1 g/dL (normal: 6.6–8.1 g/dL), serum albumin: 2.5 g/dL (normal: 4.1–5.1 g/dL), C-reactive protein: 0.3 mg/dL (normal: 0.00–0.14 mg/dL), ESR: 5 mm/1 hour (normal: 0–15 mm/1 hour), interferon γ-release assay (-), sIL-2 receptor: 682 U/mL (normal 121–613 U/mL), Hepatitis C virus (HCV) antibody (-), Hepatitis B surface (HBs) antigen (-), rapid plasma regain <0.4 R.U. (normal: 0–0.99 R.U. ), Treponema pallidum haemagglutination assay: 0.04 s/CO (normal: 0–0.99 s/CO), anti-nuclear antibody: 40 (0–39.99), anti-double strand DNA (anti-ds DNA) antibody: 0.6 (normal: 0–12.00 U/L), thyroid stimulating hormone (TSH): 9.250 µIU/mL (normal: 0.35–4.94 µIU/mL), and free T4: 1.13 ng/dL (normal: 0.70–1.48 ng/dL). Analysis of the pleural fluid showed that it had a pH of 7.471, cell count of 1850/µL, protein of 4.9 g/dL, albumin of 2.9 g/dL, glucose of 109 mg/dL and adenosine deaminase of 11.8, indicating its exudative nature. Pleural fluid cytology indicated no malignant cells. Analysis of the pericardial effusate showed a pH of 7.477, cell count of 2125/µL, protein of 4.7 g/dL, albumin of 2.6 g/dL and glucose of 102 mg/dL. Cytology of the pericardial effusate also showed no malignant cells. Culture of pericardial and pleural effusions grew no pathogens. Urinalysis showed no proteinuria. Nuclear scintigraphy imaging (99mTc-human serum albumin [HSA]) showed no evidence of protein-losing gastroenteropathy (figure 3). Biopsy specimens of the pleura and pericardium showed fibrous hyperplasia with sporadic inflammatory cell invasion (figure 4A,B). Nuclear scintigraphy imaging (99mTc-human serum albumin) showed no evidence of protein-losing gastroenteropathy. (A) Biopsy specimen of pleura showed non-specific inflammatory change (fibrous hyperplasia and sporadic inflammatory invasion). (B) Biopsy specimen of pericardium showed non-specific inflammatory change. 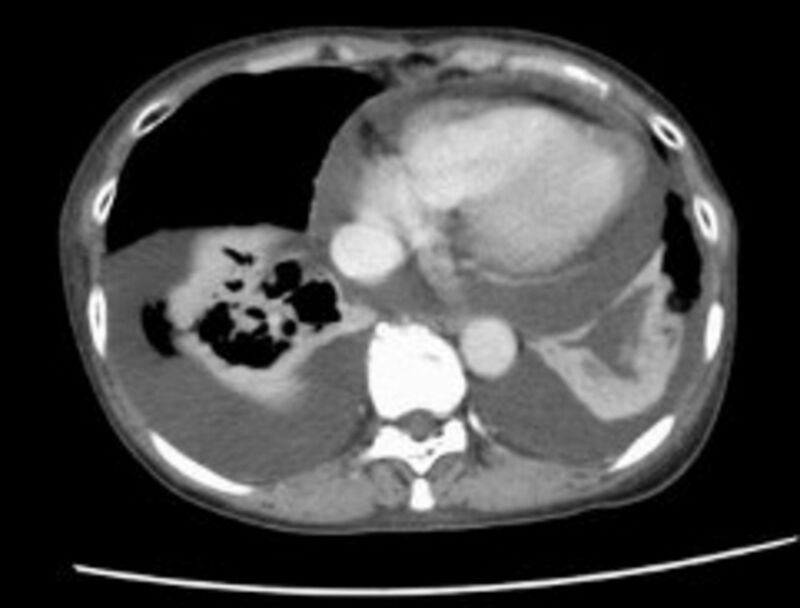 Based on the exudative nature of the pleural effusion, hypoproteinaemia without renal dysfunction or gastrointestinal tract leakage and the absence of any other distinctive pleural and pericardial findings, our differential diagnosis included recurrence of thymoma, pericarditis due to other malignant diseases, constrictive pericarditis (tuberculous pericarditis) and serositis due to connective tissue disease. Laboratory investigation indicated mild hypothyroidism. We then administered levothyroxine (25 µg/day) for 35 days as a way of therapeutic diagnosis. The TSH level decreased from 9.250 µIU/mL to 5.093 µIU/mL (normal: 0.35–4.94 µIU/mL). After almost normalisation of the TSH level, her symptoms remained stable, which was because we evaluated that hypothyroidism was not the direct cause of her symptoms. PCIS seemed to be less likely as a differential diagnosis because of the absence of elevation of inflammatory markers (CRP or ESR) and the presence of systemic oedema, which is not a typical symptom. Constrictive pericarditis (tuberculous pericarditis) was ruled out because of the exudative nature of the pleural effusion, absence of calcification of the pericardium, no evidence of right atrial compression on echocardiography and no growth of any pathogen from the culture of the pleura and pericardium. Pericarditis due to other malignant diseases was also ruled out because biopsy of the pleura and pericardium showed non-specific inflammatory cell infiltration and fibrous hyperplasia. Imaging studies indicated a low likelihood of recurrence of thymoma. Serositis due to connective tissue disease seemed less likely due to the absence of symptoms, consistent with connective tissue disease and negative auto-antibody tests. We finally made a diagnosis of PCIS. We decided to administer colchicine (0.5 mg/day) and aspirin (2.4 g/day) as therapy for recurrent pericarditis,3 although they were ineffective. Then, we administered the glucocorticoid prednisolone at the dose of 40 mg/day (1 mg/kg) as second-line therapy. Three days after the start of glucocorticoid therapy, her symptoms of dyspnoea and oedema were alleviated and she started losing weight. After 2 weeks of therapy, the prednisolone dose was reduced to 25 mg/day (0.6 mg/kg) and she was discharged from our hospital. We used patient symptoms, physical examination, body weight, chest X-ray and serum albumin levels to assess the efficacy of treatment. She visited our hospital every 2 weeks for tapering of the glucocorticoid dose. We are now tapering the glucocorticoid at a rate of 2 mg every 2 weeks. Currently, she is receiving 10 mg/day of prednisolone, tapered from 40 mg/day. Her symptoms have not recurred and her weight has remained reduced. Chest X-ray has not shown an increase in pleural effusion. Her serum albumin level remains above 3.5 g/dL. The diagnosis of PCIS can be made using an integrated approach based on the clinical course and the results of physical examination, laboratory data and imaging studies, and by the exclusion of other possible aetiologies. There are no standardised criteria for the diagnosis of PCIS. The delayed diagnosis in our case was due to the prolonged interval between the causative surgical procedure and onset of symptoms, and the atypical presentation. However, step-by-step exclusion of other disease entities finally led to the correct diagnosis. In the diagnostic approach to PCIS, its latency in onset, symptoms (including oedema), laboratory data and pathological findings are of interest. Hence, we reviewed several cases to collect these data. A PubMed search using the key words ‘post-cardiac injury syndrome’, ‘post-pericardiotomy syndrome’, ‘post-myocardial infarction syndrome’ and ‘post-traumatic pericarditis’ identified 13 cases written in English with our required clinical data.4–14 The interval between surgery and the onset of symptoms (or hospital admission) ranged from 16 hours to 3 months in these case reports. In our case, this interval was about 9 months. Among the 13 previous cases, 10 cases had fever,4 5 7 8 10 11 13 14 1 did not,6 and 2 did not mention about fever.9 12 Out of the 13 cases, 10 cases had elevated CRP,5 7–10 12–14 1 did not,11 and 2 was not described about CRP.4 6 Among 13 cases, eight cases4–7 10 12–14 had elevated ESR, with ESR data being unavailable in the remaining five cases.8 9 11 14 In our case, both CRP and ESR were not elevated. An examination of the pleural fluid showed that the effusion was exudative in all six cases in which thoracocentesis was performed.4 6 7 9 11 14 In the other seven cases, there was either no description about thoracocentesis or it was not performed.5 8 10 12–14 Our case also showed exudative pleural effusion. None of the previous cases experienced systemic oedema, unlike our case. Only four of the 13 cases underwent pathology examinations,6 8 11 all of which revealed non-specific inflammation. This suggests that pathological evaluation is inconclusive in diagnosing PCIS. Our case had an atypically long interval between surgery and symptom onset. She also had an atypical presentation, with systemic oedema due to low proteinaemia from the exudation of serum protein. In our case, the almost similar concentration of proteins in pericardial effusate, pleural effusate and serum (4.7 g/dL, 4.9 g/dL and 5.1 g/dL, respectively) suggests that protein leakage into the third space (pericardial cavity and pleural cavity) was the cause of hypoproteinaemia. The long latency, atypical presentation (systemic oedema and no fever) and absence of inflammatory marker elevation delayed the diagnosis in our case. However, after excluding other possible causes, we made a final diagnosis of PCIS. Fever and inflammatory marker (CRP, ESR) elevation may or may not be present in patients with postcardiac injury syndrome (PCIS). PCIS can cause systemic oedema, probably due to inflammatory leakage of protein and fluid into the third space. A long interval (9 months) between surgery and symptom onset might occur in patients with PCIS. Contributors MN wrote the draft version of the script. NG and KH analyzed and interpeted the data. KS revised the script and gave the final approval for publishment.